OR JUST PLAIN YOU.CAMEOS MAKE THE BEST HEIRLOOMS. DO NOT KNOW WHAT TO GET? A website born out of the love for the hand carved SHELL CAMEOS. 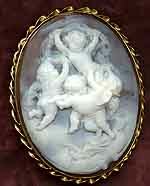 Museum quality antique and vintage carved cameo .We specialize in the rare and hard to find themes. We have the cameo for you! The best antique cameos on the net.I pride myself in only offering fine quality artistic cameos.There are no substitutes for a fine cameo. I promise to bring you quality and unique items; satisfaction guaranteed. I pride myself on good customer service. Being an artist, I love color, design, detail, and uniqueness. 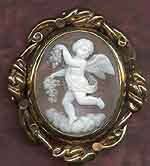 Of course, my first love will always be shell cameos.. Because of this love, I have prepared for you a special online tutorial on buying, care and cleaning, and the history of cameos. I am always interested in trading camos for gold jewelry. Maybe you have some you no longer wear or need! Right now I am only looking at cameos that are over 100 years old and very finely carved.DO NOT SEND ANY PICTURES WITHOUT FIRST EMAILING ME!!!!! If you have bookmarked any of my pages you may have to refresh them to see new items added all the time! * I prefer personal or business checks and money orders. . Please make checks payable to Jan Campbell, money orders will be shipped immediately, checks upon clearance; I normally wait 4 business days for checks to clear.I do not accept charge cards that do not go thru PayPal. * ITEMS ARE SUBJECT TO PRIOR SALE. Payment must reach me within 7 days of order or item will be put back in inventory. * Please email me to order and include a brief description of the item and number if available..Your order will be confirmed via e-mail.I am extremely hard of hearing so I prefer the email rather than phone.You can copy and paste the description in your email if you like. * All items are guaranteed to be as pictured and described. I strive to make your shopping experience a pleasant one.If you have any additional questions or need more pictures on items please email mePlease be 99% sure you want item before ordering-I will not return items for buyers remorse or if an item doesnt fit.If you are returning an item you must contact me within 24 hrs that you are sending it back.Item must be mailed within 3 days of receiving it.The buyer will pay return postage insured and the same way it was sent..The item must be mailed back within 3 days. of delivery notification.No refunds for items sent back after 7 days. * To order please click on EMAIL JAN below. * I do accept layaway. ***.1/3 down and 2 payments 60 days total. DEPENDING ON AMOUNT I WILL DO MORE Contact me..If for some reason layaway does not go thru there will be no refunds of monies paid on unfinished lay-a-ways.I will issue a credit to be used for other items on my site..There will be no returns on lay-a-way items.ALL LAY A WAYS ARE FINAL. Lay a ways are check or money order only no charges.